Officer Gabrielle Camacho, the first female K-9 officer on the Camden County force, and her partner, Peyton. Camacho and Peyton will work in narcotics and community relations. For most women, bringing work home with them involves a laptop or pile of papers - not a high-energy, tail-wagging bundle of fur. But for Officer Gabrielle Camacho, work during off-duty hours now means caring for her new partner, Peyton, a 11/2-year-old Labrador retriever. Camacho is training to become the Camden County Police Department's first female K-9 officer. "It's a huge adjustment," said the 23-year-old officer, who has been with the department for two years. "It's kind of like having my own kid now." 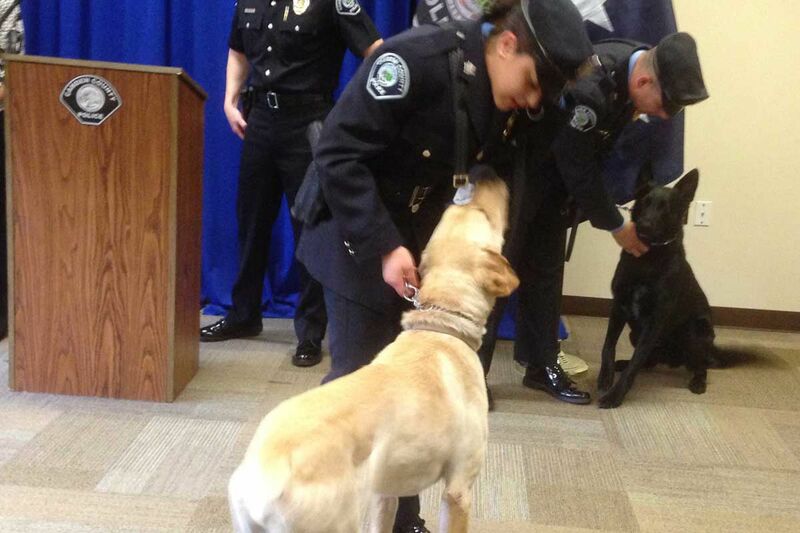 Camacho and Peyton, who are midway through a 10-week training program, will work in narcotics and community relations. The officer, who will be the eighth member of the Camden County force's K-9 unit, will be stepping into a traditionally male-dominated role. The former Camden City department never had a female K-9 officer, and women in such roles are relatively rare. That's in large part because of the small percentage of women working on police forces - across New Jersey, just about 9 percent of law enforcement officers overall are women, according to the most recent FBI data. In Camden County, there have been few positions on the now-growing K-9 unit, and previous openings had not attracted much interest from female officers, Chief J. Scott Thomson said. "The opportunity was not there," he said, noting that the unit is a demanding job. "It's a life commitment." But Camacho, an animal-lover who owns three other dogs, said she didn't hesitate when she was approached about the opening. "I was very excited and very honored," said Camacho, who had been working in the neighborhood-response unit and was inspired to enter law enforcement by her father, a captain in the department. "I was 100 percent for it." In addition to Camacho and Peyton, the Camden K-9 unit is getting another boost: the Associated Humane Societies is donating five body armor dog vests, which normally cost $2,100 each. The dogs "go into harm's way far more often than most people realize," Thomson said. For newcomer Peyton, the job will involve a combination of street work and engagement at schools and other events. He's learning to detect all types of drugs, and already has a personality primed for interacting with the community. His tail was bandaged Friday as a result of what Camacho called "happy-tail syndrome" - the friendly pup had wagged his tail so enthusiastically that he injured it. "He's very friendly, very energetic and a hard worker," Camacho said.